Considering the varied weather Rutland Water is fishing amazingly well. The recent serious heavy rainfall and change in wind direction from west to north east influenced conditions. The winds have now settled down. The shoreline from Sykes Lane right through to Cardiac Hill is producing great results with nymphs and buzzer patterns working well. 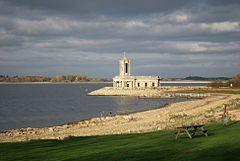 Rutland Water is recognised as the UK’s leading brown trout reservoir. A number of superb Browns were caught last week with many of these released. Boat anglers Neil Hodgson and John Wood returned fish around the 8lb mark recently. While Simon Edwards brought a 5lb 14½oz Brown to the scales with a bank fished specimen that fell to a hares ear pattern. This particular fish had been feeding heavily on ‘Demon’ shrimp, snails and a solitary 4 inch Perch! Other anglers experiencing these superb fish were Paul Tweddle and David Moore. 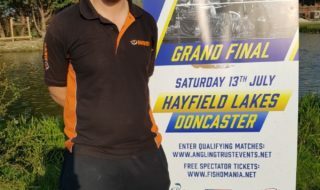 They both fished the England Eliminator on Sunday and had Browns of 4lb 14¾oz and 4lb 14½oz respectively. This match also accounted for a number of other big browns and some were returned due to the captor having already taken his one fish limit. Sheffield anglers Roger Oliver and Martyn Herbert had three great days boat fishing, catching 127 fish in total. Martyn returned specimens of 6lb 14oz and 4lb 8oz. Roger had a couple at 4lb 10oz and 4lb 1oz. The pair had Rainbows to 4lb 14oz. Most of their fish were returned and all fell to a size 12 black buzzer. Their friends Steve Alcock, Tony Jenkins, Mick Herbert and Dave Bower also contacted plenty of fish, with browns of 4lb 1oz and 3lb 8oz. Despite the very unsettled cold, wet and windy conditions prospects are excellent with lots of insect activity. Best Rainbow: 4lb 14oz taken by taken by Roger Oliver. Best Brown: 5lb 14½oz taken by Simon Edwards. Best boat areas: Sykes Lane to Cardiac Hill; Whitwell Front, Willow Bay, the Mound. Best bank areas: Sykes Lane all the way through to Cardiac Hill; Old Hall to Yellowstone. Best methods: Bank – Floating lines with nymphs/buzzers. Best methods: Boat – above the bung, mini/large lures, dries fished on various sinking lines. Mid week boat winner: W Mackey of Bedlington. Beginners courses 6,18 & 25 May; 2,13,17 and 30 June and other dates throughout the season. Boat handling courses 15 & 31 May; 7 & 25 June and other dates throughout the season. Grafham continues to fish well with a rod average of 5.2 despite the inclement weather. Some good fish have been showing again this week with nearly 50% of those taken weighing in at over 3lb including some fantastic rainbows and huge browns. Mr Kornitsky and Mr Broothall share the top weight for the biggest Rainbow at 4lb 8oz. There have been good sized browns as well – Mr Philips took a good specimen of 6lb 2oz with the fish of the week weighing in at a whopping 6lb 5oz. This fantastic fish fell to Jim Foster and was landed at the dam from a boat with a buzzer. Jim had a fantastic day and went on to take another 14 fish to his boat. He noted that the fish were in the top five feet of water at the start of the day and then began to move deeper in the afternoon. Fish seem to be up and down in the water column with feed items including buzzer, daphnia, shrimp and snail, many are moving closer to the banks, particularly in the bays. Boat fishing has been good again with some anglers producing very large bags of fish, even in the current conditions. Most, due to the wind, have fished the north shoreline before drifting into deeper water. Good areas to try this week include G buoy, off Marlow banks, the Willows, the bowl and the mouth of the nature reserve, with Perry Point and the Seat seeing fish as well. Many are fishing floating lines with buzzer for the best results, with black, black and green and black and white colours popular. The banks are fishing very similar to last week with fish being caught along the dam and many of the bays and points on the north shore. Though as the wind changes you may find more fish around the south shoreline with the Seat, Plummer and the Harbour Arms likely to fish well. The bank anglers are producing on floating lines coupled with diawl bach and buzzer, or intermediate lines with cormorant, boobies, blobs and mini snakes. “Nine GWFFA club members fished their first bank match of the season at Grafham Water. Due to a cold Northerly wind and low temperatures most anglers opted for the deeper water and shelter at the North end of the dam. Although a truly miserable day, some good bags of fish were taken on cats whisker and black and green boobies fished deep. A few fish were also taken close to The Willows on green and black buzzer. The fish were in fantastic condition with several 3lb plus fish being caught. Anglers reported fish contained shrimp, buzzer and some daphnia. 1st Derek Bravington 8 fish for 19lb 3oz. 2nd Martin Brocklebank 7 fish for 18lb 3oz. 3rd John Vincent 5 fish for 12lb 12oz. Best Rainbow: Mr Broothall and Mr Kornitsky each took a 4lb 8oz specimen. Best Brown: 6lb 5oz taken by Jim Foster. Mid week boat winner: Mr C Honan of Bedford. Although the fishing has been quite challenging in the testing weather conditions there have been some fantastic fish coming out. Pitsford’s resident fish are feeding heavily on buzzer, but, unlike other waters, they are feeding at depth. If you fish the right areas and present the patterns a few feet down then there are some cracking fish to be caught. 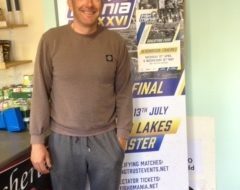 Phil Jordan has managed to master the method, fishing teams of buzzer on an intermediate line in the deep water at the dam. In two visits this week he had 16 and 13, returning all fish. 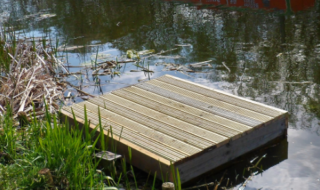 Phil had five overwintered fish in one trip with fish up to 5lb. Gavin Friell also had a good session fishing buzzers to take 9 Rainbows and a Brown around 5lb. James Punch bank fished in Stone Barn using a weighted black and red buzzer to tempt a Brown trout that he estimated at 6-8lb which was returned. Keith Gilchrist weighed in the best Rainbow of the week at 4lb 6oz when he fished the English Fly Fishers match. The match was won by Peter de Kremer with his bag weight of 18lb 14oz. his killed fish weighed an impressive 10b 14oz. in tough conditions with 20mph winds the 32 anglers caught 115 fish for a rod average of 3.6. Best Rainbow: 4lb 6oz taken by Keith Gilchrist. Best Brown: 7lb taken by James Punch. Best boat areas: Dam, Sailing Club, Small Half. Best bank areas: Gravels, Stone Barn. Mid week boat winner: Chantrelle Lyall. Despite the changeable weather conditions Ravensthorpe continues to fish well. Mark Benstead had a couple of trips to Ravensthorpe and managed 18 fish and 17 fish. His tactics were sink tip line with a fab on the point and black skinny buzzers on the droppers. Mark Griffin also had some good sport with floating line and buzzer. The bank has been fairly slow due to the clear water but Alan Duffin has been catching a few fish from platforms 6 and 12, again on buzzer. Best boat areas: Domes, Island, Causeway. Best bank areas: Platforms 3-8.